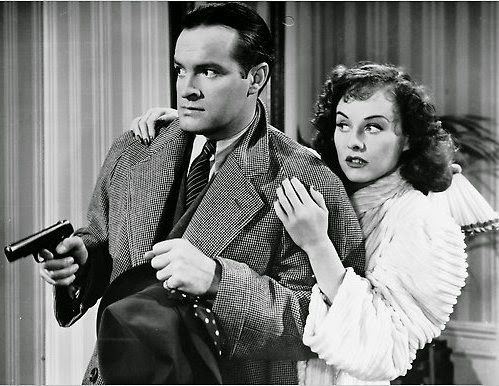 Bob Hope and Paulette Goddard. One of Bob Hope's best films, The Ghost Breakers is a first-rate haunted house comedy that benefits from a funny script and a strong cast. Made in 1941, it reteams Hope and Paulette Goddard from the similar The Cat and the Canary (1939). Both movies features spooky settings and were adapted from stage plays. However, while The Cat and the Canary comes off as a bit creaky, The Ghost Breakers holds up nicely. Bob plays a radio broadcaster named Lawrence (Larry) Lawrence (his middle name is Lawrence, too--"My parents had no imagination"). He has a radio show on which he's billed as "the man who knows all the rackets and all the racketeers." While visiting a hotel to see a disgruntled gangster, Larry accidentally fires a gun at the same time another man is fatally shot. Thinking he has committed a homicide, Larry hides in the hotel room of Mary Carter (Paulette Goddard). Mary has recently inherited a Cuban castle called Castillo Maldito, located on the ominous-sounding Black Island. For 20 years, no one has been able to spend a night in the castle and survive until morning. 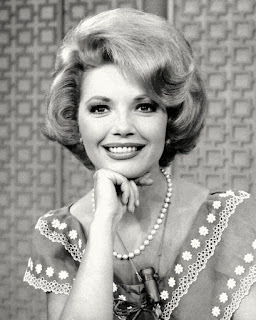 Additionally, an anonymous individual offered to buy the estate for $50,000, although Mary refused to sell. She helps Larry evade the police and, in return, he agrees to accompany her to the eerie castle. He keeps his promise even after he's cleared of the murder rap--and Mary receives a note stating: "Death waits for you on Black Island." By that point, it's clear that Larry has become smitten with Mary. CARLSON: It's worse than horrible because a zombie has no will of his own. You see them sometimes walking around blindly with dead eyes, following orders, not knowing what they do, not caring. HOPE: You mean like Democrats? 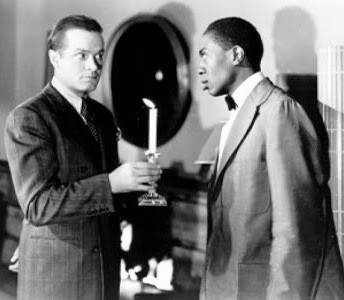 Bob Hope and Willie Best. Willie Best, who worked with many of the best comedians in Hollywood, has perhaps his most substantial role as Larry's valet. He and Hope form a funny team and, as Thomas Cripps points out in his book Slow Fade to Black, they even subtly poke fun at racial stereotyping: "As he (Best) fumbles with oars, Hope says, 'I thought you rowed for Harlem Tech'...(Later) they reverse the old humor when they see an apparition and Hope panics while Best says, "I know better.'" scenes that emphasize Paulette's legs. Paulette Goddard is in top form as the plucky heroine and genuinely seems to be having fun. The same could be said for the rest of the cast, which includes Noble Johnson as a zombie, Paul Lukas as an untrustworthy solicitor, and Anthony Quinn playing twins. Look fast and you might even spot Robert Ryan in his film debut as an ambulance driver. The Ghost Breakers was loosely based on the 1913 Broadway play The Ghost Breaker by Paul Dickey and Charles W. Goddard. 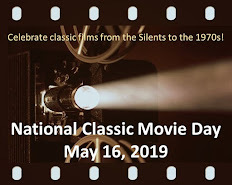 It was adapted twice previously as silent films. Additionally, Dean Martin and Jerry Lewis starred in a 1953 remake called Scared Stiff. It's one of their better comedies and features Lizabeth Scott as Mary. 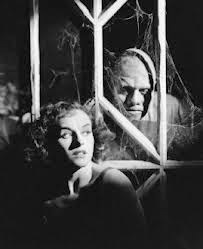 It was directed by George Marshall, who already knew the plot pretty well--he also helmed The Ghost Breakers. Bob and Paulette in their earlier film. After recently watching The Ghost Breakers again, I sought out the Hope-Goddard version of The Cat and the Canary (1939). Although the mist-filled Louisiana Bayou seems promising in the opening frames, the film quickly dissolves into a straightforward haunted house comedy. It's mildly amusing, with Goddard holding most of the plot together (the delightful Gale Sondergaard and George Zucco are sadly underutilized). Bob Hope still seems to be getting comfortable playing a lead role. It's amazing how much more assured he would be just one year later in The Ghost Breakers. My recommendation is that--if you just see one of these two spooky comedies--your best bet is The Ghost Breakers. It's not scary, but if you're a 'fraidy cat, please note Bob's confession: "I'm so scared, even my goose pimples have goose pimples." Excellent review of one of my favorite films. I have been a Bob Hope fan for years and this is one of his best. As you state, this holds up better than THE CAT AND THE CANARY (though it’s not bad), and the laughs never stop thanks to a great script and Hope’s timing. And Goddard looks great as always. A great choice for a Halloween viewing. Great job, Rick! "The Ghost Breakers" is a delightful film for Halloween viewing. Bob Hope, Paulette Goddard, and Willie Best have a lot of fun. The setting, the story, and the relationships all come together to work movie magic. By the way I loved the title to this article because Hope ain't 'fraid of no ghosts! 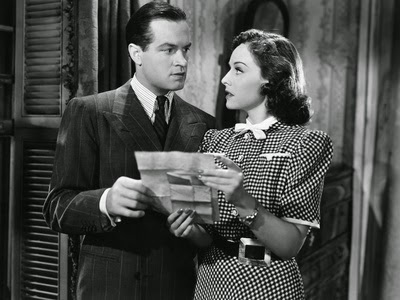 Bob Hope movies so many corny lines – and I can't get enough of 'em! He always makes me laugh, and this looks like one I'd enjoy. Thanks for the recommendation! This is without doubt one of my top 5 comedies -- I can watch it 100 times and still laugh. One of my favorite scenes is the zombie's mother who comes in the castle, screams and runs -- Hope says "Upstairs at the end of the hall." This movie is just filled with great lines. Bob Hope said that Willie Best was one of the best comedians he had ever worked with. To me, Willie was a large part of the success of the movie. Good job on assessing this wonderful movie, Rick!